the air masses above the Arctic have low pressure, and the entire area is surrounded by a circular vortex of wind currents, keeping the frigid polar air contained. Everything is what you’d expect: a cold Arctic and mild continents. These conditions are known as the positive phase of the North Atlantic Oscillation (NAO), an index of fluctuating wind and temperature patterns that impacts weather on both sides of the Atlantic. The negative phase is different, and quite rare: high pressure over the Arctic forces the cold air to spill out over North America and Eurasia, allowing warm air to rush into the polar region. Meteorologist Jeff Masters has a great analogy for a negative NAO: it’s “kind of like leaving the refrigerator door ajar–the refrigerator warms up, but all of the cold air spills out into the house.” The Arctic becomes unusually warm, and the temperate regions of the surrounding continents become unusually cold. Strong warming over the Arctic is melting the sea ice, not just in the summer, but year-round. Open water in the Arctic Ocean during the winter allows heat to flow from the ocean to the atmosphere, creating the high pressure needed for a negative NAO to materialize. Paradoxically, the cold, snowy weather many of us are experiencing could be the result of a warming planet. After a decade of warmish winters, the long, difficult season, felt nationwide, subjected denizens here to complications of yore. Squads of neighbors dug each other’s cars out. Temperatures cycling around freezing produced roads of black ice. Municipal plowing budgets were busted by mid-December. There were runs on full-spectrum light bulbs and gym memberships for cases of seasonal affected disorder and cabin fever tremulosis. Lots of unabashed winter sports enthusiazing for fun and by necessity. I managed to partake in a Minnesota tradition, breaking a little bone in my foot running for a bus across the icy moonscape. No snowshoe racing for me. Even the ducks took a bullet. In Pierre, South Dakota up to 7000 mallards died ingesting moldy grain from a feedlot. With wetlands along the Gulf of Mexico paved over for development and heavily subsidized agriculture near-year-round in the Midwest many ducks and geese have foregone seasonal migration, sticking around this far north even through the bad winters. And now with what some village elders have called ‘spring’ arriving–man, it’s been a long winter–all that snow is going to melt. University of Minnesota professor Mark Sealy lists five general factors that together scale the potential for spring floods: fall soil moisture up until the winter freeze, soil frost depth, snowfall and the water content in the snow cover, forecasts of spring precipitation, and the spring thaw intensity and duration. the threat of flooding is high. In the context of the current situation in Minnesota for this winter the only factor that has been below normal is the depth of soil frost, which was less than normal around the state this year. In fact in many places there is little of any soil frost left. But the BIG PLAYERS in the threat of spring flooding this year are (1) saturated soils with little room to hold more water, and (2) abundant seasonal snowfall and snow water content (4-6 inches) that is yet to melt and begin flowing through the state’s watersheds. Obviously the biggest uncertainties rest with the final two factors in this conceptual model: Will March and April deliver above or below normal precipitation amounts? Models suggest that precipitation will be above normal for the second half of March. It also looks like March may start to exhibit a warm up as early as next week, but hopefully there will be frequent freeze/thaw cycles to gradually meter out runoff from the snow pack. So let’s see, according to local meteorologist Paul Douglas, 2010 was the wettest year in Minnesota history. Check. September was the wettest on record. Check. December the snowiest. Check. And much of Minnesota soils are in the 99 percentile in saturation. Check. This week’s sudden appearance of warm weather and spring showers in the forecast should release (and add to) the snowmelt Kraken. AT THIS POINT WE COULD SEE SIGNIFICANT RISES ESPECIALLY FOR THE COTTONWOOD…REDWOOD… MINNESOTA…CROW AND MISSISSIPPI FOR ST PAUL AND DOWNSTREAM…AND THE ST CROIX RIVER BASINS OVER THE NEXT FIVE TO TEN DAYS. FOR THESE RIVER BASINS…WE COULD POSSIBLY SEE FLOOD STAGE LEVELS AS EARLY AS NEXT WEEKEND. Let me tell you, when Paul Douglas double-takes, Minnesota trembles. Do not sit on this man’s bar stool. We could be talking 1997 bad, when the Red River discharged at 30,000 ft3/sec, equivalent to a 250-year flood, gushing out from the confines of its riverbed as a lake 25 km wide. The Red River of the North forms North Dakota’s border with Minnesota. Oriented north-south, the river meanders from Lake Traverse to Lake Winnipeg along the flat Red River Valley, a vast plain 80 km wide in some places. Despite its name, Natural Resources Canada tells us, the Valley predates the river. The erosion of its Mesozoic bedrock during the Tertiary and Quaternary Periods exposed more resistant Paleozoic rock, creating a lowland surface between the Manitoba Escarpment to the west and the Precambrian shield to the east. Along the central Valley, the lowland bedrock is buried beneath late Pleistocene glacial sediments and topped with clay-rich glaciolacustrine sediments deposited in glacial Lake Agassiz. During the late Pleistocene and early Holocene Agassiz at various stages occupied most of Manitoba, eastern North Dakota, northwestern Minnesota, northwestern Ontario and east-central Saskatchewan. As the lake receded northward 8000 years ago, the river remained stranded on the lake bed, eroding a shallow stream-cut valley no more than 15 meters deep. With no significant reductions in topography along its course, the river undertakes little of the headward erosion needed to deepen the valley. That is, there is very little room to put any added water. Climate conspires with geology. The Red River is an unusual North American river. It flows south to north. The winter snowpack melts south-first, producing a twice-over whammy. First, the southern floods dam up against northern ice, spilling out of the river’s channel. Second, the out-of-phase melting permits floods new momentum as the snowpack recedes northwards. 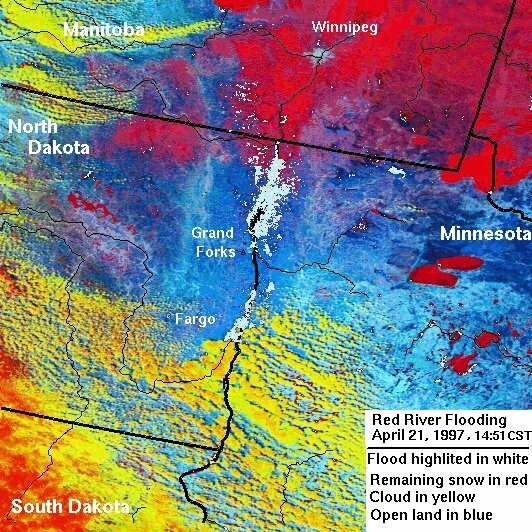 As the nearby 1997 remote image shows, most of the snow in North Dakota and Minnesota has by this point melted (and flooded), but a substantial amount of snow (in red) remains in Manitoba. Flooding along the Red River appears to be increasing in frequency and magnitude. What were 50- and even 100-year floods are showing up with disturbing regularity. The resulting damage is due in part to climatic shifts associated with El Niño moisture, but also from efforts aimed at controlling flooding. 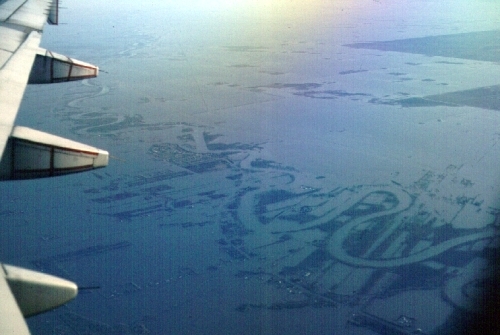 Dikes and floodways have encouraged development on the Valley’s floodplain, draining wetlands which have traditionally served as flooding sops. During the 1997 floods, runoff per square mile spiked abruptly in April in the south branch of the Buffalo River watershed, which has less than 2% of wetlands remaining, while rising only slightly in the Otter Tail watershed, which still has 25% of wetlands remaining. Preliminary model runs suggest that for higher leaf area indices, flood peaks are indeed lower and spread over a larger amount of time. An expansion in conventional farming, driven by commodity prices and the threat of farm consolidation, has also cut into natural flood barriers. Agribusiness finally makes its appearance in the post. For Red River Valley farmers flood damage is synergistic with many of the area’s endemic agricultural problems: farm debt, consolidation, volatile commodity prices, shifting weather patterns, and the loss of natural habitat. Fusarium Head Blight, or scab, began devastating spring wheat and barley crops throughout the region on an unprecedented scale. Estimates of combined primary and secondary losses from 1998-2000 total more than $1.4 billion for Minnesota and North Dakota alone. The disease is associated with wet soils, and has a complex mode of attack that has been difficult to breed against for resistance or to control chemically. Measures to control soil erosion further exacerbated the problem by providing organic matter to harbor the fungus over winter for next year’s crop. The combination of factors leading to the persistence of scab from year-to-year represents a new stability regime. Wet climate conditions not only exacerbate the impacts of the scab outbreak, but increase the vulnerability of grain crops in particular to other crop diseases including wheat leaf rust, root rot, and tan spot. Potatoes and sugar beets—the main nongrain crops in the Red River Valley–are also vulnerable to disease. Precipitation during the 1990s was significantly higher overall than average and in intensity and was the wettest period on record. The abnormal climate cycle has also generated regular climate-related “disasters”, increasing the pressures on farms to survive. Severe floods have wiped out crops, threatened urban communities, and damaged infrastructure. The historic flood of 1997 came at the peak of the scab epidemic, and was estimated to have caused over $5 billion in flood damage expenditures, property and agriculture losses. Changes in federal farm policy, global surpluses in crop production, and the weakening of the international economy have combined to generate increasing volatility in net farm income, with commodity prices falling to record low levels in several of the last years [as of 2004]. Long-term changes in farm structure, cropping systems diversity, buying consolidation, and declining public research investment in small grains research have also contributed to the underlying economic fragility and ecological instability. Large scale monocropping, drainage, agricultural and floodplain development has rendered the system more vulnerable to the kind of catastrophic floods and disease outbreaks experienced in the 1990s. In cropping systems, short term success in optimizing production of a limited number of commodity crops leads to long-term unintended consequences and emergent surprise (e.g. disease epidemics, loss of crop insurance, international price collapses, yield declines). Recommended rotation cycles include a one to two year break between grain crops; however, there are few options for alternative crops. Collapse into a new stability regime—in which large-scale scab epidemics persist from year to year, farms are unable to produce profits, and federal disaster payments are regularly required—may have been precipitated by the interaction of internal, fast dynamics of wheat scab with slow variables such as changing climatic patterns, tillage, cropping, and drainage practices, and commodity prices that imposed major external physical and economic disturbances and increased the vulnerability of crops to scab. By deforestation in the global South, by CAFO plumes worldwide, by killing off wetlands, by overbuilding in the name of flood control, by monoculture and consolidation, by grain dumping and price manipulation, capitalist agriculture has helped open a geologic Pleistocene Park right here in Minnesota. Increasingly frequent 100-year floods model in not-so-miniature ancient Lake Agassiz. This entry was posted on March 15, 2011 at 6:33 pm and is filed under Ecological resilience, Sustainable farming with tags agribusiness, climate change, flooding, Kristin Blann, Lake Agassiz, Minnesota, North Atlantic Oscillation, Paul Douglas, Red River, scab, snowmelt, wetlands. You can follow any responses to this entry through the RSS 2.0 feed. You can leave a response, or trackback from your own site.